At least the mountains look nice. 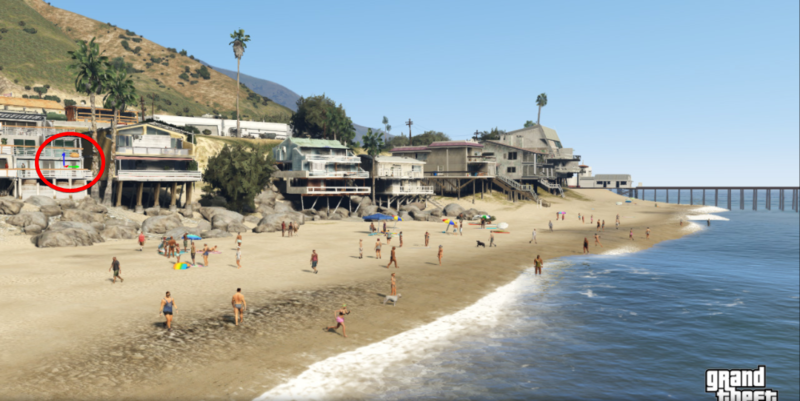 However, I won't let R* tricking me into thinking that these static pictures aren't played with ( I already hate them for playing us like a damn fiddle 7 months of thinking that, oh, it's just 5 months and we will be playing the game). Happened with plenty of pre-release screenshots of GTA V. Some bullshot work might be in there and they're not getting away with that again. Still, I'm sure the game will look and play fantastic. 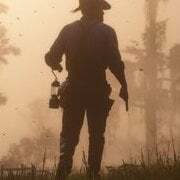 Seems like it's set in the 1890s john was born in 1873, he ran away with dutches gang when he was a teenager, in the late 1980s so by 1890s hed be in his early 20s, suggestions that he could be returning in RDR2. 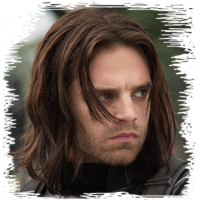 Hopefully as the main protagonist or a playable character. Where are you getting this? Is there anything in these screens that dispute that time setting? And what makes you so sure John wont be returning? Plot twist: Rockstar is going to re-use that annoying little sh*t Jack Marston as the young John Marston character. Just to troll our poor, pathetic asses. They hate us. Is that a Civil War uniform duster? I assume it's already been asked and answered here. Man! I hope they include a close camera view like this in the game. Would be very immersive especially when riding/walking in towns and saloons. The MC is packing some detail. I love that once again our character carries what's equipped from the revolver and bowie knife to the Sharpe rifle on his back and poseables bag. I noticed in the other shot he doesn't have the bag so again I'm thankful for more clothing and customization options. 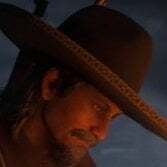 Seems like it's set in the 1890s john was born in 1873, he ran away with dutches gang when he was a teenager, in the late 1980s so by 1890s hed be in his early 20s, suggestions that he could be returning in RDR2. 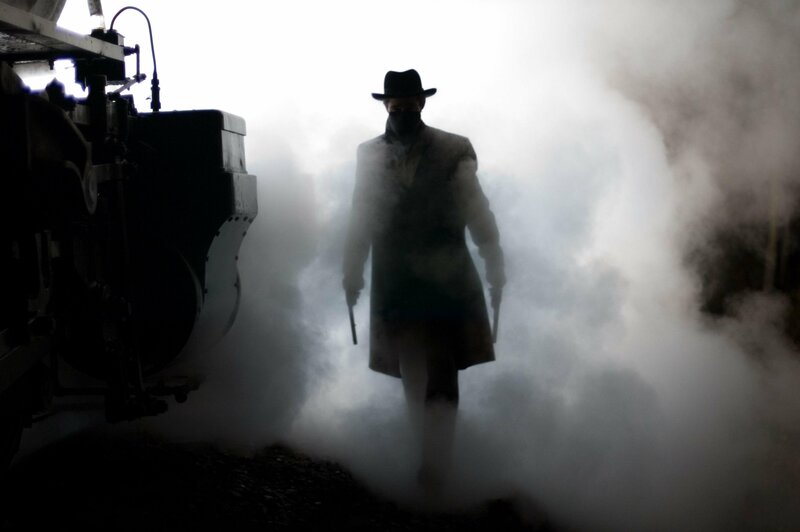 Hopefully as the main protagonist or a playable character.Nah 1890's is too late.. cant believe you think John will be returning.. come on guysWell its the whole gang, if you played the first game you can makeout the characters from the old game, the setting the train and the fact that theres more buffalo suggests its at around that time, also you can pretty clearly see johns outline in the poster its obvious the way he standing and dressed, hell even facial features, im pretty sure he'll be back i just hope we xan play as him and that leaker guy is wrong. 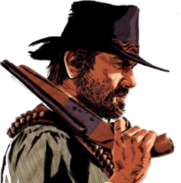 Maybe R* thought or saw that they Fu*ked up not putting john as a playable character if thats the case, and chosr to delay the game to make him playable who knows just my CRAZY speculation. 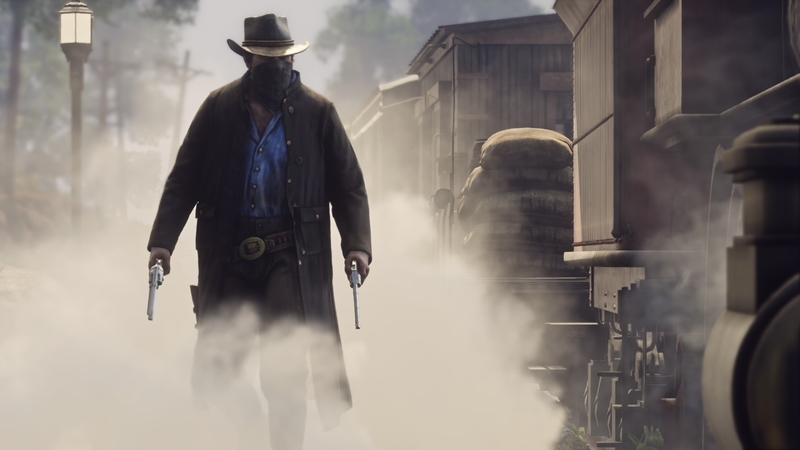 I think they've added a few details to his coat, which is a given, but to me it looks like they made him bigger and burly compared to the trailer. 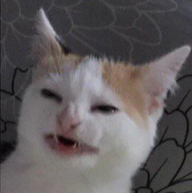 The fact that (one of) the (potential) protagonist(s) (?) holds 2 different guns makes me think about a weapon system similar to MP3's. Love the screens, by the way. These lonesome protag shots give me an Assassins Creed vibe. And I don't want that associated with RDR2. That's definitely the protagonist or at least one of many. He looks to me on the fatty side and kinda reminds me of the drink-addicted protagonist of True Grit body wise.
) That's one hell of a movie,very dramatic, I wonder if they also took some inspiration storywise. I saw that on Twitter earlier and after some adjusting and resizing of my own in Photoshop, I think I found something pretty interesting. I believe the sign on the back says "Stage coach" with a symbol of a horse between the two words and smaller, illegible text above and below it. 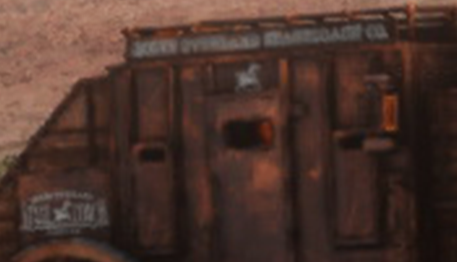 At the top there's a 5-6 letter word that I can't quite make out ("Becky" or "Rocky" are my best guesses but it looks like it could begin with an S as well), followed by "Overland Stagecoach Co."
"The Overland Trail was a stagecoach and wagon trail in the American West during the 19th century. 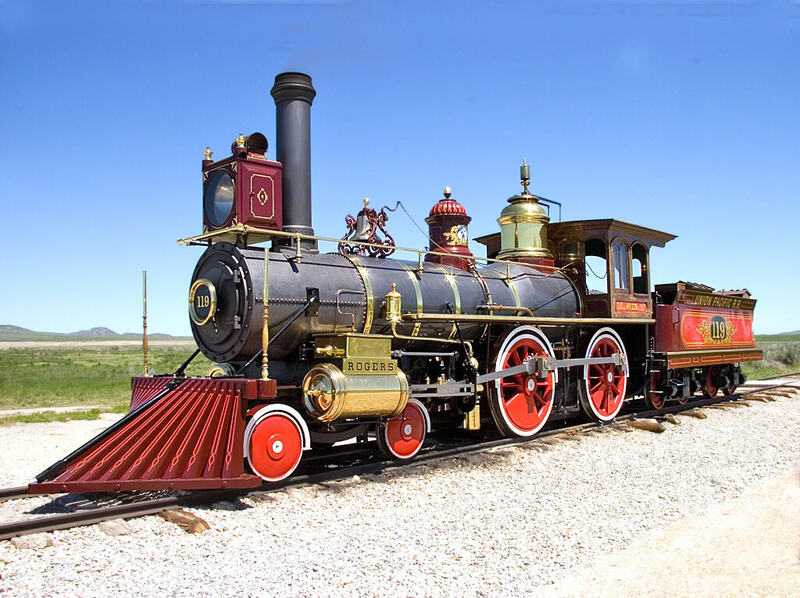 - The Overland Trail was famously used by the Overland Stage Company owned by Ben Holladay to run mail and passengers to Salt Lake City, Utah, via stagecoaches in the early 1860s. Starting from Atchison, Kansas, the trail descended into Colorado before looping back up to southern Wyoming and rejoining the Oregon Trail at Fort Bridger. -"
So basically, the Overland Stagecoach Company really existed in the old west, and it traveled on a route called the Overland Trail. I don't want to over-analyze or speculate too much over a single screenshot, but this is a screenshot analysis thread so I'm going to do exactly that. 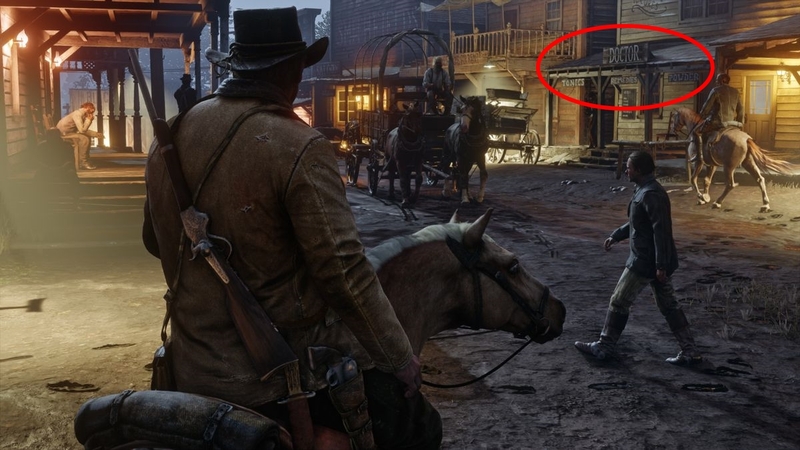 There's a town or region of the map with the name "Overland" in it (think Cholla Springs, Gaptooth Ridge, Rathskeller Fork etc. from RDR) Could "Rocky Overland" or something like that be a town or region in the game? 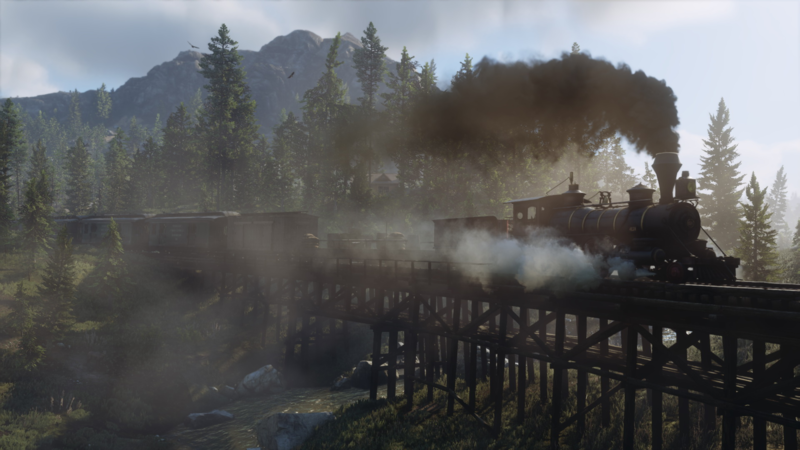 "Overland" is simply being used in the name of a stagecoach company as a small reference to the real-world old west trail and stagecoach company. Perhaps the first word at the top that I can't decipher is indeed a first name and "Overland" is the last name? Maybe I'm reaching just a bit, but with so little information, all we can really do at this time is speculate and craft our own theories. I could be right and Overland could end up being significant or it could simply be a small reference. Either way, I thought this was worth pointing out and discussing. The locomotive looks a lot like the Union Pacific No. 119, aka the 4-4-0 steam locomotive. 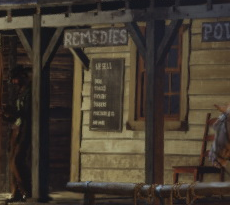 Can't quite make anything out but if the Doctor store is anything like RDR1 this might be a list of possible things we can buy in the game. No photoshop wizard though, not sure if it's possible to clean up the text. So this is where we will end up after we are wasted? Also I wish we can buy meds to heal ourselves. The horse on the right is also missing some shadows. Stuff like shadows missing is probably for the same reason the cart tracks look ahead of the cart (they don't look pre-made always there tracks IMO). It's probably to do with them going forwards and backwards in time to find the right shot - if you've ever used the editor for screenshots you might have experienced it. Stuff like particles, shadows, foot/wheel prints, damage etc gets left over or ends up missing. It doesn't look like all houses are enterable sadly. Maybe it is a bit far fetched, but couldn't it also hint towards the protagonist changing his physique throughout the game? Similar to how Max Payne shaved his head during a dark time, the RDR2 protag could get burlier during certain points in the story, where he let himself go. It will most probably be just like with most R* Games, that some special interiors will be enterable, but those that are probably will be very detailed designed. I'm not sure if the "Robert Redford" was intentional but pretty funny either way. You're right though, great movie. sh*t you beat me to it. Oops Haha ! Fixed it ! It is 1880 at the absolute earliest. The train shown is the classic western 4-4-0 layout, and it's design in particular is post-1870. We can also see electric streetlights multiple times, and electric streetlights weren't even first installed in a major city until 1878. They didn't become widespread in the USA until 1890, and even then mostly only in major cities. So to have them in what is clearly a smaller frontier town would indicate post-1890, possibly even as late as 1900. Of course, R* could say 'f*ck it' to historical accuracy and make it set in 1875 or some sh*t, and give us an AK47 and a Lamborghini as well.